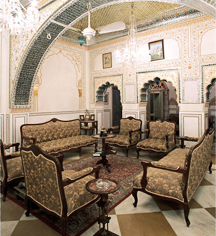 Sheesh Mahal, meaning Glass Room, was the original formal sitting room of Alsisar Haveli. This decadent venue is adorned with large family portraits of ancestors, gold gilded frames, vintage crystal chandeliers, and ceilings of antique reflecting glass. This room is approximately 325 sq ft in size. 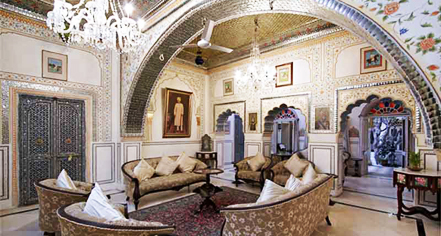 Converted into a regal dining hall, Darbar Hall is styled with large crystal chandeliers, high soaring ceilings, and beautiful mughal era motifs. Darbar Hall is approximately 70 feet by 30 feet in size can accommodate seating for up to 70 people.